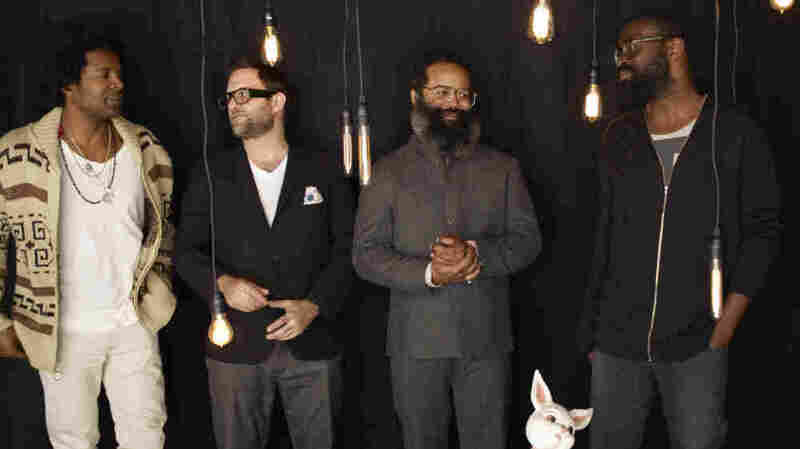 TV On The Radio On World Cafe : World Cafe The Brooklyn band is one of the biggest acts in rock music today. Listen to an interview with the group and hear five songs live. TV on the Radio appeared on World Cafe. Brooklyn band TV on the Radio are simply one of the biggest acts in rock music today. Combining everything from jazz, soul, hip-hop and electro-pop, the group has carved out a niche entirely its own. This April, TV on the Radio released Nine Types of Light, its fourth LP and another bold step that defied expectations. Coming off of the funky percussion and new wave synths of Dear Science, the record is downright calm by comparison. Some have called it a lovers' album, full of muted beats and humble melodies. Shortly following the album's release, bassist Gerard Smith died after a long battle with lung cancer, making the already contemplative Nine Types of Light all the more poignant. Hear the band perform three songs from the new album, as well as two old favorites, in this edition of World Cafe. This World Cafe segment originally aired May 27, 2011.